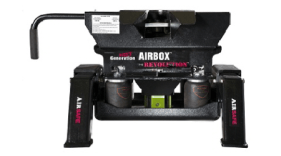 The AIRBOX “Next Generation” is the most versatile and compact Air Hitch system ever designed. It’s economically priced and engineered with AIR SAFE (AirSafe™) tough. 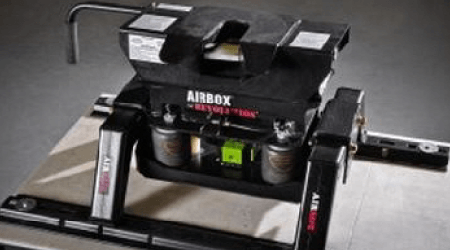 Whether you have a long box, short box and need a regular rail base, or underbed system, the AIRBOX “Next Generation” is your ticket to a First-Class air ride at the price of coach! If you have a Mor-Ryde Pin Box that assist with reducing the back and forth chucking but you still have the bouncing up and down problem, then the AirBox hitch is the solution. It works with the Mor-Ryde system and give you the up and down control and lets the Mor-Ryde system control the back and forth chucking. If you don’t have a Mor-Ryde system and you need the back and forth, and also the up and down control you should look at our Omni-Directions hitches. 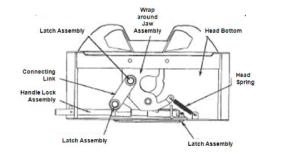 By placing four commercial grade air bags directly below the hitch head it allows it to become a compact air hitch that virtually absorbs all trailer damage to AIRBOX forces. Its tough but lightweight design allows you to quickly and easily remove it when not needed and quickly re-attach when needed. If you have ever been wondering if an Air Hitch system is for you, here is your answer. You and your passenger deserve the very best..
NEW: We offer an exclusive Air Safe adapter for the Fords and after-market Reese Underbed systems. 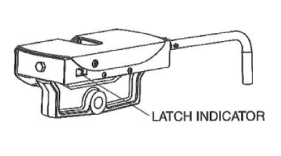 Look at the indicator located on the front forward surface of the hitch head assembly. When it is extended out of the housing, the king pin is fully seated.